* High-quality resin producing a stronger handle. * Enhanced “Sonic Welding” of the handle for added durability. 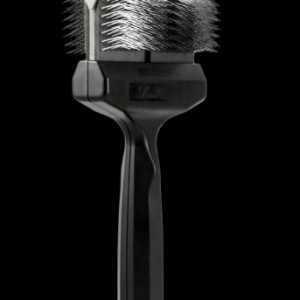 * New & Improved Ultra-Polished Stainless Steel Bristles provide a comfortable grooming experience. 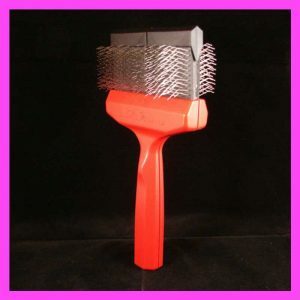 * Bent-tip bristles on both sides of the brush head designed to efficiently detangle the coat. * An enhanced “comfort bump” to create an ergonomic grip whether using with the right or left hand. * 100% “Made in the USA” construction to support Putting America to Work. GREEN ~ The Green Variety has a medium-soft flexible brush head. Use the Green Variety for brushing the puppy coat (any length) and for brushing the short-length adult coat (usually 3-inches or shorter). This variety can be used on a curly or wavy coat. PURPLE ~ The Purple Variety has a slightly firmer brush head. 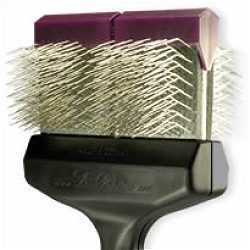 Use the Purple Variety for brushing the long-length adult coat (usually longer than 3-inches). This variety can be used on a curly or wavy coat. MAT ZAPPER ~ The Mat Zapper is recommended as an accessory brush. It should not be used to brush the entire coat. This tool is for removing isolated stubborn mats only. The brush head and bristles are very firm. 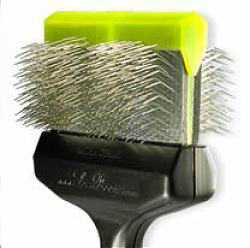 Using this tool in combination with your Les Poochs Green or Purple brush will help to extend the life of your Les Poochs brushes. 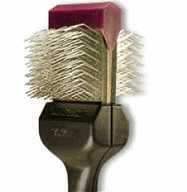 GOLD ~ Use this soft Finishing Brush for dogs with fine, sensitive, and short coats. 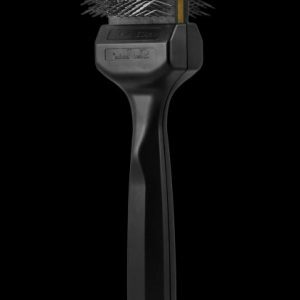 The bristles and flexible head of the Les Poochs Gold Brush allows you to gently groom without worrying about causing discomfort to dogs that are extremely sensitive. 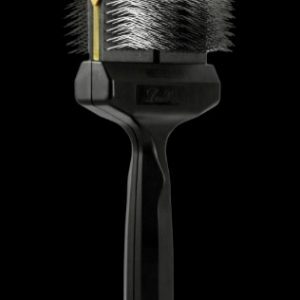 Also use this finishing brush for fluffing during drying to create a spectacular show finish. 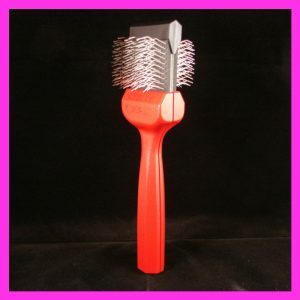 SILVER ~ The Silver Brush is a fantastic Deshedder and a fabulous firm Finishing Brush. 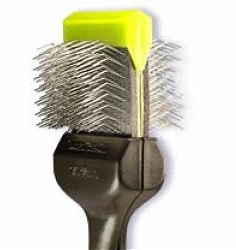 The bristle layout allows you to more effectively dashed double coated breeds. It gently, but efficiently, removes dead hair from the undercoat, leaving a soft shimmer. 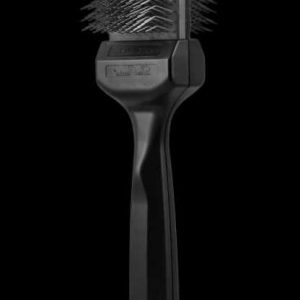 Also use this brush for fluffing during drying, and for thinning the coat behind the ears and legs. REGULAR SIZE ~ The Regular Size is 1-3/4 inches in width and it is recommended for Doodles that weigh 30-pounds or less. 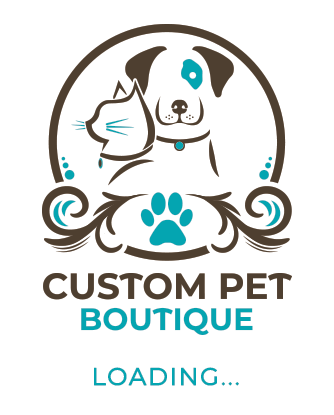 This size is also convenient for brushing the narrow contours, ears, lower legs and tail of the larger doodle. WIDE SIZE ~ The Wide Size is 3-1/2 inches in width and it is recommended for Doodles that weigh more than 30-pounds. This size is twice the width of the smaller brush so it saves time when brushing a larger doodle.